In deveploping MaestroNano, we tested many different type spectrophotometer, of course including micro-scale spectrophotometer. So, here we want to provide our experience of micro-scale spectrophtometer as purchasing reference. This chart is brief but is easy to differentiate every kind spectrophotometer. At the beginning step, purchaser have to think one question: is there only a little sample for measurement in general case? If the answer is "Yes", you definitely need micro-scale spectrophotometer since traditional spectrophotometer would cost too much samples in dilution. If the answer is "No", then please consider the next question: do you often have to measure many samples at one time? If the answer is "Yes", you also need micro-scale spectrophotometer since dilution and cleaning cuvette would cost a lot of time when using traditional spectrophotometer. If the both answers are "No", congratulation! You only need tradtional spectrophotometer, it is cheaper and the more accurate(by serial dilution) than most micro-scale spectrophotometer. Once decide to purchase micro-scale spectrophotometer, you must be very careful to choose the most proper one. As everyone know, micro-scale spectrophotometer is more expensive and you may not need so many different functions in general. For choosing micro-scale spectrophtometer, please evaluate this question first: do you measure non-nucleic acid samples more often than nucleic acid sample? 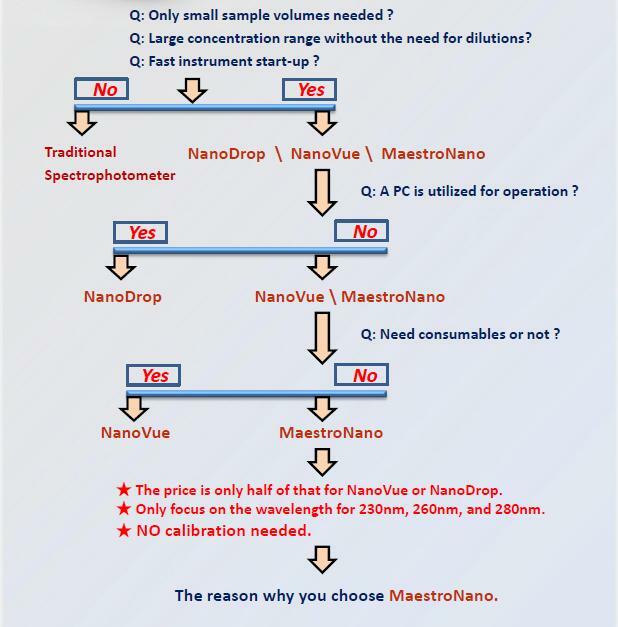 If the answer is "Yes", purchaser had better to consider those micro-spectrophotometer which could measure whole wavelength, such as NanoDrop, NanoVue or PicoDrop. But if the answer is "No", we believe MaestroNano is your best choice. Its price is almost the same as traditional spectrophotometer and only need 2ul samples; stability of data is also outstanding. If you measure non-nucleic acid samples more ofter than nucleic acid samples, there is some comments in choosing micro-scale and whole wavelength spectrophotometer. If you have restricted space in laboratory, and there is no room for a seperated PC, you may consider NanoVue. NanoVue embedded computer inside and would save your space. If your space is enough, we would suggest you to purchase NanoDrop. Although it need larger space to set up and need calibration after period of time, its repeatibility and reproducibility is very good. 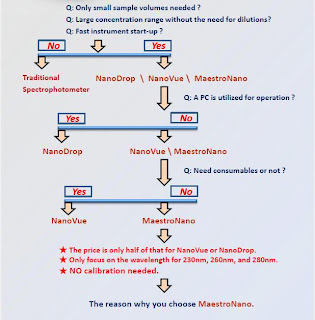 Actually NanoDrop is the only micro-scale spectrophtomer we have tested which could enjoy the same performance as MaestroNano. We hope these experience be helpful for your decision of purchasing! your information is really awesome as well as it is very excellent and i got more interesting information from your blog. UV transilluminator is a standard piece of equipment used in life science laboratories for visualization of target DNAs and proteins. For more details contact on 9422311257 .xitij instrument is the best company in pune and india. At Xitij Instruments we care about the users who care about finding the new things! And we care about finding new state of art instruments like UV Transilluminators and other lab equipments.